Continuing their annual rock and metal promotion dubbed Ticket To Rock, Live Nation has announced discounted group tickets to some of our scenes biggest names. 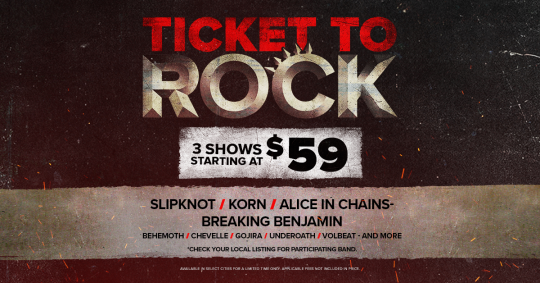 As seen on the image above, the world’s largest concert promotion company will be offering reduced ticket prices to select summer shows featuring Slipknot, Korn, Alice In Chains, Breaking Benjamin, Behemoth, Chevelle, Gojira, Underoath, Volbeat, Shinedown, Slayer and more. While full tour lineups and dates will be announced soon, tickets for the highly anticipated shows are currently on sale now and can be found here. 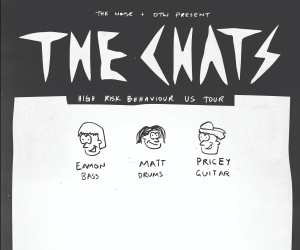 For more information on the Ticket To Rock promotion, head here. For participating venues, see below.